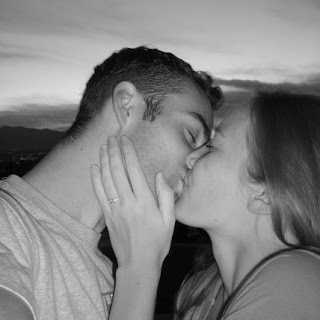 The following was written by Brett for our wedding blog about our engagement. I thought it would be nice to post it on here as well. The official engagement took place October 20th, but had been in the planning stages for quite some time. This Monday evening was our 2.5 year anniversary (including a 2-year stint of seperation) and dates have always been important and special to us. We love to find a reason to celebrate, so we jumped at this occasion. I asked Haley if she would like to go to the pressbox at EHS, the location of our first date, and recreate the whole thing. She gladly accepted, and we started planning it all out. We would watch Roman Holiday, starring Audrey Hepburn, eat Twizzlers and Hershey Kisses, and watch the sunset. I showed up to pick her up around 6:30 pm, we hurriedly got our things together and fled to our beloved pressbox. The ring was stashed away in a bag that I allowed her to carry. (It killed her when she found out) Upon arriving on top, we took a few pictures, recreating the pictures we took 2.5 years prior to that night. I knew I needed to do it soon for a few reasons, one; the sun was setting and she needed to be able to see the ring, and two; I was so nervous I didn't know what to do with myself. She gave me a beautiful card, full of affectionate words. While she was sitting down I told her to close her eyes while I got her gift ready. When I said "open," her high hopes were crushed a little as she saw me holding a card with her name on it. I told her it would make more sense if she stood up, so she followed my instruction and stood up. While she read my little note I casually reached down to the bag, and donned my jacket. She finished the card, I smiled, we embraced, and I told her I loved her. I could sense the curiosity in her, and I knew that it was the time. I quickly dropped to one knee, whipped the ring box out of my left coat pocket, and while looking her in the eyes, asked "Haley Jaye McAllister. Will you marry me?" She started to get teary-eyed, then smiled and laughed, and with a big smile responded "YES!" She was antsy to get it on her finger, so I gently slid the vintage-style ring onto that special finger of her left hand. We both looked at the striking combination of the ring and her hand, and knowing what it represented, kissed each other and basked in a moment that will never be forgotten. We then proceeded to take a few pictures, in order to remember well that evening. Then phone calls were made to family and friends announcing the good news that, "IT'S OFFICIAL!" And so goes the tale of our engagment. Labels: Before the "i do"